By 1979, my quest for new lines to travel over was taking me further away from North Wales, and for this month's shot we are in South West Wales at Milford Haven. Making its first appearance on my website, the mainstay of South Wales traffic (and unheard of in the North at the time), is the Class 37. 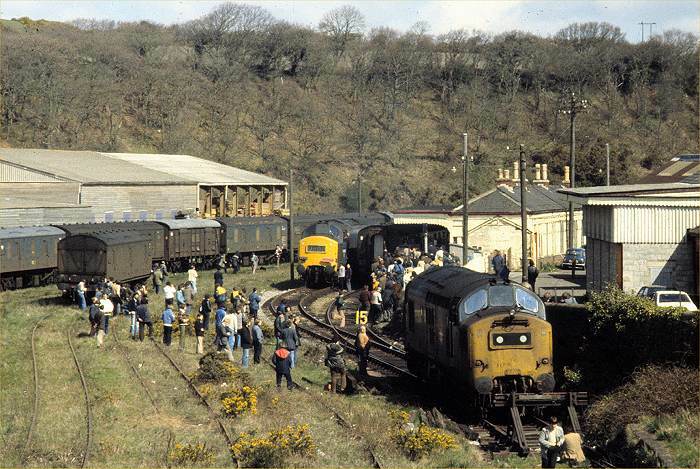 This picture was taken on Saturday 5th May 1979, when the RPPR railtour from London Paddington to Fisguard, Pembroke Dock and Milford Haven was at the latter place. Locos 37253 (left) and 37177 (right) are running round their train in the small station. In the more relaxed railtouring conditions of the time, the tour participants spread themselves across the surrounding sidings. Many parcels vans are present, and in another siding beyond the station, the sleeping car for the overnight service to London was also here. This railtour started at Paddington the previous evening, and ran via Gloucester.It visited Carmarthen no less than four times before and after each of the 3 West Wales branches (no topping and tailing in 1979! ), making for rather a long day.